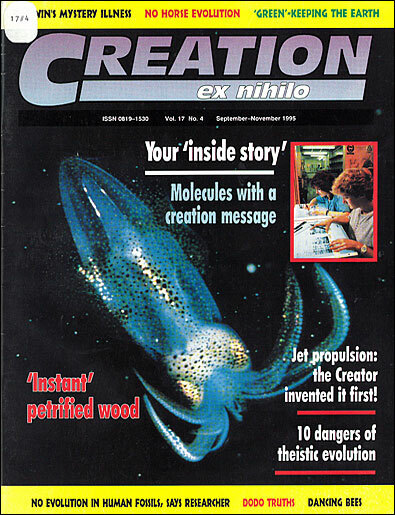 ‘Instant petrified wood’—so ran the heading to the announcement in Popular Science, October 1992.1 It’s also the reality of research conducted at the Advanced Ceramic Labs at the University of Washington in Seattle (USA). Researchers have also made wood-ceramic composites that are 20–120% harder than regular wood, but still look like wood. Surprisingly simple, the process involves soaking wood in a solution containing silicon and aluminium compounds. The solution fills the pores in the wood, which is then oven-cured at 44°C (112°F). According to the lab’s research director, Daniel Dobbs, such experiments have impregnated the wood to depths of about 5 millimetres (0.2 inches). Furthermore, deeper penetration under pressure and curing at higher temperature have yielded a rock-hard wood-ceramic composite that has approached petrified wood. However, priority for the discovery of a ‘recipe’ for petrification of wood must go to Hamilton Hicks of Greenwich, Connecticut (USA), who on September 16, 1986 was issued with US Patent Number 4,612,050.2 According to Hicks, his chemical ‘cocktail’ of sodium silicate (commonly known as ‘water glass’), natural spring or volcanic mineral water having a high content of calcium, magnesium, manganese, and other metal salts, and citric or malic acid is capable of rapidly petrifying wood. But in case you want to try this ‘recipe,’ you need to know that for artificial petrification to occur there is some special technique for mixing these components in the correct proportions to get an ‘incipient’ gel condition. The patent indicates that the amount of acid in the solution appears to have a critical effect on the production of the gel phase within the cell structure of the wood, although evaporation also plays its part. Wood thoroughly impregnated, even if necessary by repeated applications or submersions of the wood in the solution, after drying evidently has all the characteristics of petrified wood, including its appearance. Fireproofing wooden structures such as houses and horse stables (the horses wouldn’t be tempted to chew on the wood either!). Greater strength wood for structural uses. Insect, decay and salt water ‘proofing’ wood in buildings, etc. The chemical components used to artificially petrify wood can be found in natural settings around volcanoes and within sedimentary strata. Is it possible then that natural petrification can occur rapidly by these processes? Indeed! Sigleo4 reported silica deposition rates into blocks of wood in alkaline springs at Yellowstone National Park (USA) of between 0.1 and 4.0 mm/yr. ‘. . . from Mrs McMurray [of Blackall], I heard a story that rocked me and seemed to explode many ideas about the age of petrified wood. Mrs McMurray has a piece of wood turned to stone which has clear axe marks on it. She says the tree this piece came from grew on a farm her father had at Euthella, out of Roma, and was chopped down by him about 70 years ago. It was partly buried until it was dug up again, petrified. Mac McMurray capped this story by saying a townsman had a piece of petrified fence post with the drilled holes for wire with a piece of the wire attached. ‘. . . Piggott writes of petrified wood showing axe marks and also of a petrified fence post. ‘This sort of thing is, of course, quite common. The Hughenden district, N. Q. [North Queensland], has . . . Parkensonia trees washed over near a station [ranch] homestead and covered with silt by a flood in 1918 [which] had the silt washed off by a flood in 1950. Portions of the trunk had turned to stone of an attractive colour. However, much of the trunks and all the limbs had totally disappeared. ‘On Zara Station [Ranch], 30 miles [about 48 kilometres] from Hughenden, I was renewing a fence. Where it was dipped into a hollow the bottom of the old posts had gone through black soil into shale. The Gidgee wood was still perfect in the black soil. It then cut off as straight as if sawn, and the few inches of post in the shale was pure stone. Every axe mark was perfect and the colour still the same as the day the post was cut . . . .
1. Entry of silica in solution or as a colloid into the wood. 2. Penetration of silica into the cell walls of the wood’ structure. 3. Progressive dissolving of the cell walls which are at the same time replaced by silica so that the wood’ dimensional stability is maintained. 4. Silica deposition within the voids within the cellular wall framework structure. 5. Final hardening (lithification) by Drying out. Furthermore Oehler9 had previously shown that the silica minerals quartz and chalcedony critically important in the petrification of wood, can be made, rapidly in the laboratory from silica gel. At 300°C (572°F) and 3 kilobars (about 3,000 atmospheres) pressure only 25 hours was required to crystallize quartz, whereas at only 165°C (329°F) and 3 kilobars pressure the same degree of crystallization occurred in 170 hours (about seven days). The evidence, both from scientists’ laboratories and God’ natural laboratory, shows that under the right chemical conditions wood can be rapidly petrified by silicification, even at normal temperatures and pressures. The process of petrification of wood is now so well known and understood that scientists can rapidly make petrified wood in their laboratories at will. Unfortunately, most people still think, and are led to believe, that fossilized wood buried in rock strata must have taken thousands, if not millions, of years to petrify. Clearly, such thinking is erroneous, since it has been repeatedly demonstrated that petrification of wood can, and does, occur rapidly. Thus the timeframe for the formation of the petrified wood within the geological record is totally compatible with the biblical time-scale of a recent creation and a subsequent devastating global Flood. Phil McCafferty, ‘Instant petrified wood?’, Popular Science, October 1992, pp. 56-57. Hamilton Hicks, ‘Mineralized sodium silicate solutions for artificial petrification of wood’, United States Patent Number 4,612,050, September 16,1986, pp. 1-3. As cited by: Steven Austin, CatastroRef--’Catastrophe Reference Database: Catastrophes in Earth History, Geologic Evidence, Speculation and Theory’, Institute for Creation Research, San Diego. Entry no. 267. A.C. Sigleo, ‘Organic geochemistry of silicified wood, Petrified Forest National Park, Arizona’, Geochimica et Cosmochimica Acta, Vol. 42, 1978, pp. 1397-1405. Roy Piggott, The Australian Lapidary Magazine, January 1970, p. 9. R.C. Pearce, ‘Petnfied wood’, The Australian Lapidary Magazine, June 1970, p. 33. Segment on ‘Burke’ Backyard’, Channel 9 TV, Sydney, June 1995. G. Scurfield and E.R. Segnit, ‘Petnfication of wood by silica minerals’, Sedimentary Geology, Vol. 39, 1984, pp. 149-167. John H. Oehler, ‘Hydrothermal crystallization of silica gel’, Geological Society of America Bulletin, Vol. 87, August 1976, pp. 1143-1152. R.W. Drum, ‘Silicification of Betula woody tissue in vitro’, Science, Vol. 161, 1968, pp 175-176. R.E. Leo, and E.S. Barghoorn, ‘Silicification of wood’, Harvard University Botanical Museum Leaflets, No. 25, 1976, pp. 1-47. R.C. Mernll and R.W. Spencer, ‘Sorption of sodium silicates and silicate sols by cellulose fibers’, Industrial Engineering Chemistry, Vol. 42, 1950, pp. 744-747. Sigleo, Ref 4, p. 1404.